While it takes about 4 months for most potato varieties to come to full fruition, baby potatoes are generally pulled out a month or two earlier. This results in smaller (obviously) potatoes, but also sweeter and less starchy plants at the same time. Keep reading to learn how to grow baby potatoes with this easy to follow gardening guide! Baby potatoes are super gratifying to grow because they can be quite expensive in stores, and also don’t take up too much garden space! Most potatoes are generally planted in the same manner: from mature tubers that are then cut into small pieces with one or two stem-buds. Set these about a foot or so apart directly into the ground, in raised bed, containers, or low mounds. For best results and to avoid decay, allow the cut tubers (also called seed pieces), to dry for a few days until they can heal properly. Before planting them, dust them with a natural garden sulfur. Plant these in spring, when all chances of frost are gone. Potatoes need at least 6-8 hours of direct sunlight per day, so be sure to plant in an area with full sun. At planting time, add a small amount of all-purpose fertilizer. As the potatoes start to grow, pile soil or mulch around the bases to keep the lower stems completely covered. This is a really important step as it will prevent tuber “greening” which can make the potatoes taste bitter. After two and a half to three months, you can gently start to sift through the soil. 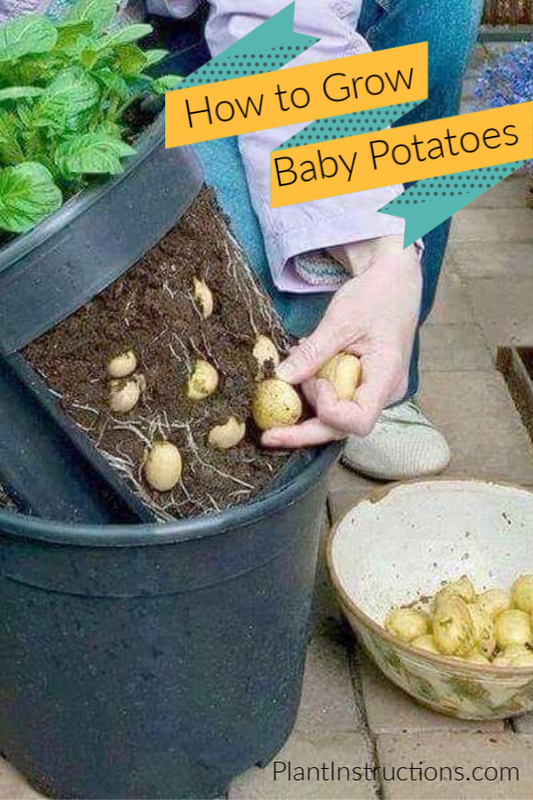 Grab the stem gently to gather the baby potatoes. Do not wash the potatoes, but rather just dust them off and store in a cool, dry place. Consume within a week or two. Most potato varieties can be harvested while small, but there are a few varieties that are already small and can be directly grown in the garden. These varieties include White Purple Majesty, Purple Pelisse, Yukon Gold, Bambino, Standard Superior, and Anya. You may not be able to easily find these at your local grocer, but you can order them online! 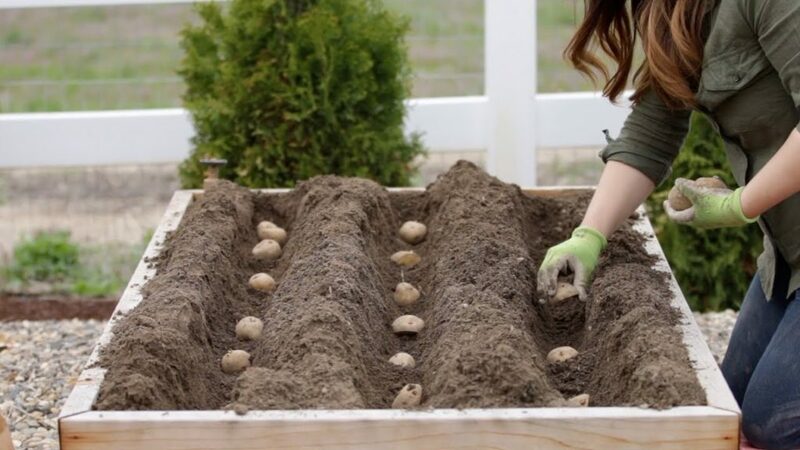 So now that you know how to grow baby potatoes, it’s time to roll up your sleeves and get to planting! 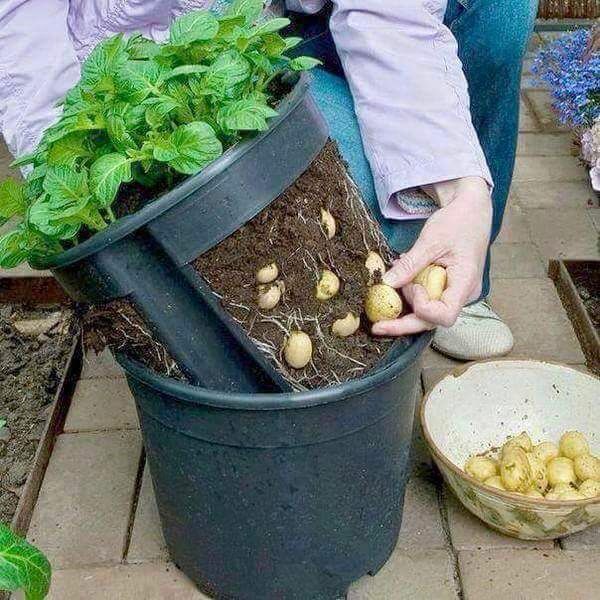 How to Grow Baby Potatoes was last modified: January 25th, 2019 by Aniela M.
PreviousWhat is Well Draining Soil?